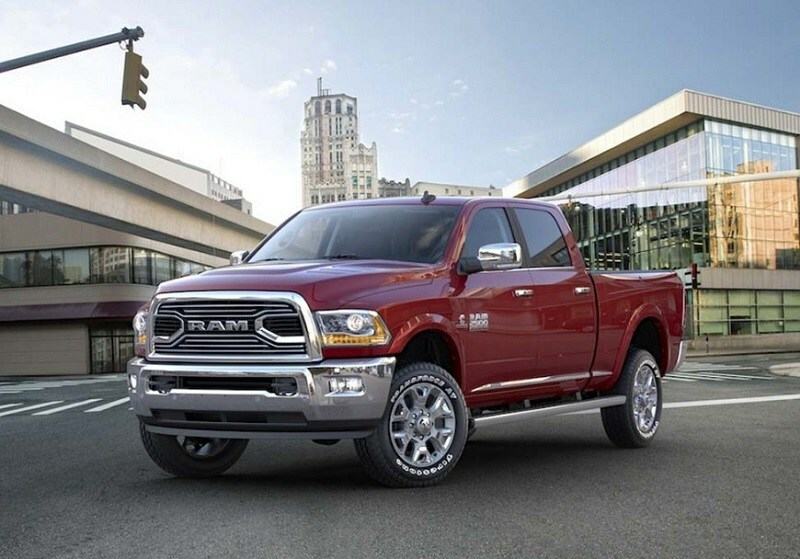 The 2019 RAM 2500 effortlessly rolls power, performance, and luxury into one fine package. This year's 2500 is stronger and more capable than in years past. The towing capacity with the diesel engine, which reaches 19,780 pounds, is the strongest yet in the 2500 family. The 2500 also gets the most horsepower (410) of its class with the gasoline engine. On the paved path, you can enjoy the 2500's superior interior amenities, including available leather seats, an oversize infotainment display screen, and a number of hand-crafted touches that have given the 2500 an award-winning interior in the past. On the outside, a design change for the latest model year has given the 2500 a sleek new look, complete with a more athletic appearance and striking LED lights. You're probably excited to try out this HD heavy duty truck, which you can do at Melloy Dodge serving in Albuquerque Santa Fe Los Lunas New Mexico. On the outside, all trim levels of the 2019 RAM 2500 in Albuquerque have a commanding presence. You have a choice of several cab lengths, which range from a regular cab with an eight-foot cab to a crew cab with either a 6.4-foot or an eight-foot cab, and a line-topping Mega Cab with a 6.4-foot cab. This year's RAM can be ordered in one of a dozen exterior paint colors. There are also three new exterior colors added to this year's lineup, which include a black, blue, and silver. There are also six types of wheel designs available. 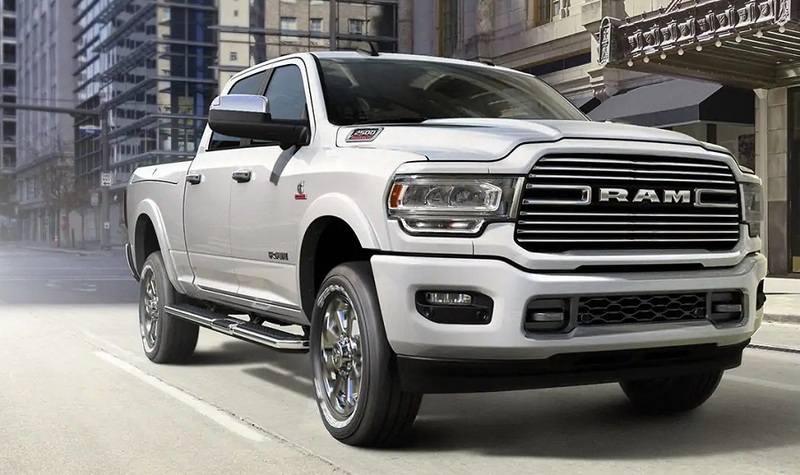 The wheels range in size from 17 to 20 inches, and you will find plenty of available choices along with the standard wheels of the trim level in the 2019 RAM 2500 near Albuquerque that you choose. Inside the 2019 2500, a standard 115V power outlet keeps your devices plugged in and ready for use. In the higher-end trims, namely the Laramie Longhorn and the Limited, you'll get over 43 inches of legroom and a premium audio experience complete with a Harman/Kardon sound system. Premium leather seats are available on select models as well to make your rides ultra comfortable, even if you're just heading to the grocery store. Standard features on the 2500 include Dodge's own Uconnect infotainment system, which puts you in charge of the car's audio system and its entertainment features. The standard size for the infotainment screen is five inches, but you can also upgrade to a larger 8.4-inch screen. 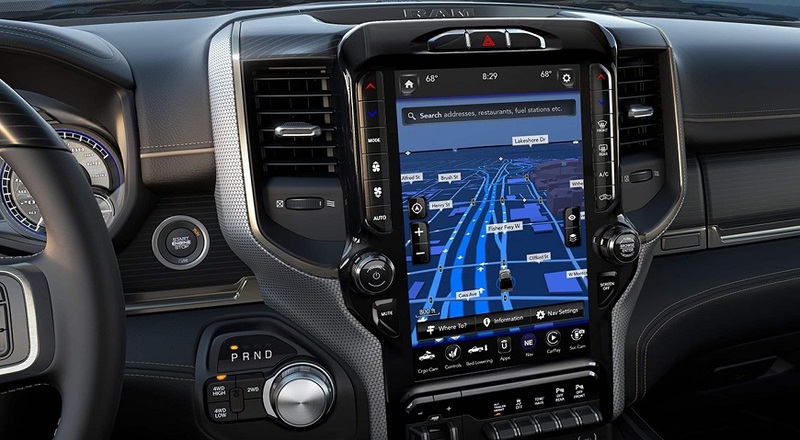 An available 12-inch infotainment display screen, which can be combined with a 17-speaker audio system, will make your excursions in the 2019 RAM 2500 in Albuquerque even more enjoyable. This year's center console has been redesigned so that there is more than nine cubic feet of storage space within the 2019 RAM 2500, which is unprecedented! A total of five USB ports, including three in the front and two in the back, are on hand to keep everyone's electronic devices plugged in and ready for use. 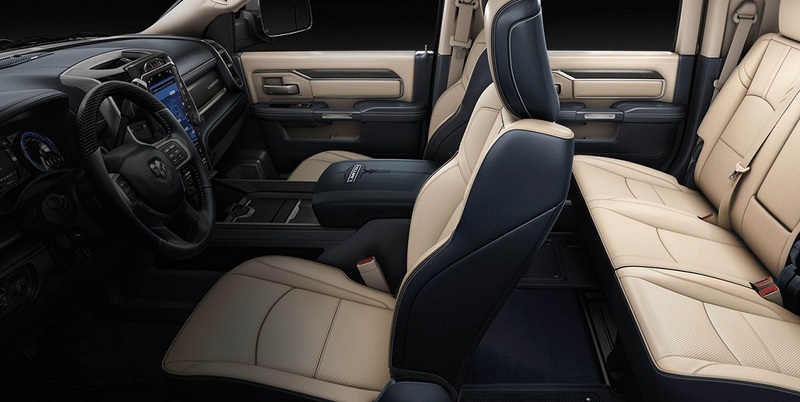 Ask about all the interior options at Melloy Dodge, serving in Albuquerque Santa Fe Los Lunas New Mexico, that are available to customize your HD heavy duty truck. There are several engine options available with the 2019 RAM 2500 in Albuquerque. The diesel engine got perhaps the biggest change of all engines in the 2500 for the 2019 model year. This year's diesel engine is a 6.7L, six-cylinder turbo-charged engine. It weighs about 60 pounds less than the previous diesel engine, but it still produces more power (up to 370 HP and an even more impressive 850 LB-FT of torque). If you choose a 2500 that runs on standard gasoline instead, you can get a 6.4L, eight-cylinder engine that produces up to 410 HP and over 425 LB-FT of torque. The diesel engine is paired with a six-speed automatic transmission, while the gasoline-powered engine is matched to an eight-speed automatic transmission. Two-wheel drive is standard, but you have the option of choosing a 4x4 configuration instead to give your 2500 more power and traction when you're venturing off the beaten path. With the 2500, you'll have a variety of safety amenities to look forward to that are designed to give you protection before, during, and after an accident. Standard safety features in all trim levels include advanced front airbags, side curtain airbags, and airbags for the back seat passengers. Towing is made safer with several additional safety features, including hill descent control and a separate camera for the cargo area. Other safety amenities you'll appreciate include electronic stability control, remote start capability, and an available parking assist system for both the front and back. Other features include an available theft deterrent system, an available security alarm, and a tire pressure monitoring system that sends a warning when the pressure gets too low in one or more of your truck's tires. Power-folding mirrors for the trailer are available, and the car can be accented with LED lights for prime visibility. In 2019, this HD heavy duty truck is back and more impressive than ever. Its standout features include a more powerful but lighter-weight engine and the best towing capacity in its class. Now, you have an enticing palate of 12 exterior colors to choose from, including three new options for the latest model year. With a number of add-on features and custom amenities that you can get to make your 2500 distinctly yours, the sky is the limit for building the truck of your dreams. When you're ready to try out the latest 2500, simply contact Melloy Dodge serving in Albuquerque Santa Fe Los Lunas New Mexico for more information.